Can’t get over this East-coast smooth rhythms! Love it to death! Gabriel Raya’s Contante & Sonante record label has been giving a platform to outstanding, but not yet well known musical talents from around the world for over a 15 years now. The projects often feature these blossoming artists grouped with seasoned L.A. session players that have yielded amazing results. 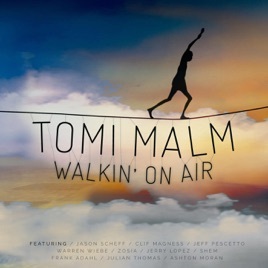 In just the past year, the label has released a fantastic album from songwriters and performers Cecily Gardner & Scott Fuller, a fascinating collection of Burt Bacharach original demos composed with lyricist Tonio K., and now the debut album from Finnish composer, arranger & producer Tomi Malm titled WALKIN’ ON AIR. Malm’s talents as a producer & arranger were first showcased when he produced the album FLY AWAY-THE SONGS OF DAVID FOSTER for Contante & Sonante back in 2009. Now the time has come for Malm’s own music to be heard, and it’s glorious. Tomi has put in the work and grasped the creative vine David Foster’s talents first extended and is running full speed ahead with the sophisticated aural atmosphere that his music creates on this special release. The album opens with the cinematic instrumental “Kuwakaribisha”, (a Swahili word meaning ‘to entertain) which sets the table beautifully for the type of quality to come. Next up is “Favor”, a musical celebration featuring the incredible Swedish vocalist Frank Adahl along with bassist Alex Al, drummer Simon Phillips, the killer horn section of Johnas Lindeborg (trumpet), Patrik Eriksson (trumpet) Andreas Andersson (alto sax), Jonas Wall (baritone sax) & Magnus Wiklund (trombone) with ZoSia on background vocals. The following ballad, “When You’re Gone” spotlights an amazing vocal performance from Dutch singer Julian Thomas that will remind you of the early recordings from El DeBarge. Batting clean up on this collection is the powerful title track “Walkin’ On Air”, an infused groove with an all-star assemblage consisting of Jason Scheff on lead vocals & bass, Dan Warner on guitar, Vinnie Colaiuta on drums, Eric Marienthal on alto sax & a horn section of Patrik Eriksson (trumpet) & Mattias Lejdal (tenor sax). Background vox are nailed by Scheff, ZoSia, Bjarne Langhoff & Tomi Malm. Additional highlights on this release include the beautiful re-arrangement of Hank Easton’s “Show Me A Sign” as a duet featuring the late Warren Wiebe with Polish songstress ZoSia, “Wouldn’t It Be Kinder” featuring Toto’s new bassist, Shem von Schroeck on lead vocals, “Let’s Get To It” with Jerry Lopez from the band Santa Fe & The Fat City Horns and “Perfect Imperfection” that features David Foster vocal alumni Jeff Pescetto. Other notable contributing players are Robbie Buchanan, Neil Stubenhaus, John “JR” Robinson, Brandon Fields, Luis Conte, James Harrah, Lars-Erik Dahle, Danny Falcone, Rob Mader, Phil Wigfall, Eric Tewalt & Nathan Tanouye and many more. Tomi Malm writes or co-writes 10 of the 12 tracks, also lending his considerable musical talents on keys and guitars in addition to his production, arranging & mixing chores. With a landmark creative statement like this, fans of this kind of quality production can rest easy and celebrate the fact that this musical torch has not only been picked up, but is also being carried forward in very good hands.